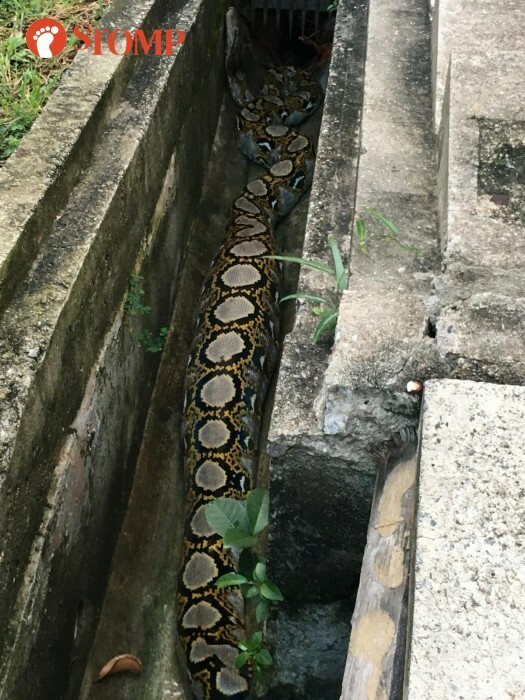 A python measuring almost three-metres-long was spotted at Block 166 Bishan Street 13 on Wednesday morning (Oct 24). Stomper Steph shared photos, which she received from her mother, showing the large reptile with an engorged belly in a drain. The snake had also slithered to a void deck. Staff from the Animal Concerns Research and Education Society (Acres) eventually rescued the snake. Police were spotted at the scene as well. Steph told Stomp: "No one was attacked. However, it did seem like the python already had his meal. I mean, look at that body! "There have been quite a number of snake sightings in Bishan. To everyone, especially those with pets, please be more careful!" Responding to a Stomp query, Acres' deputy chief executive officer, Mr Kalai Vanan, said that the wildlife rescue team received a call about the python at around 7.30am. "The reticulated python was rescued at about 8.40am," he added. The snake, which measured about two-and-a-half to three metres in length, will be safely relocated to a more suitable habitat. Members of the public who see any wildlife in distress or in need of help can call Acres' 24-hour wildlife rescue team at 9783 7782.